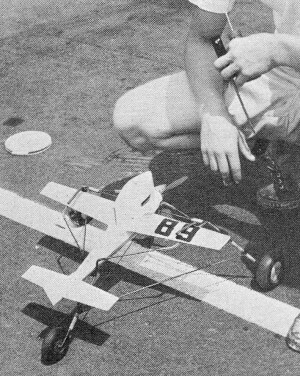 Control line speed model rests in launching dolly. As plane becomes air­borne after take-off run around the flight circle, dolly drops away. Plastic scale models can be purchased in a variety of sizes and scales. 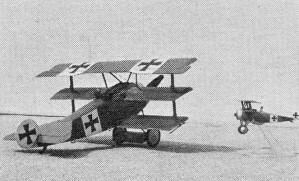 Two Fokker triplanes above are American molded 10-1/4" span and English Airfix 3-3/4" span, 1/72 actual size. 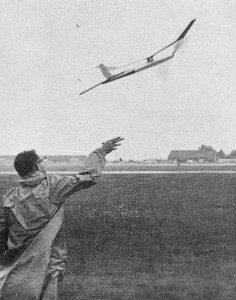 Rubber powered Wakefield model flown (be­low) by former National champion, Henry Struck of Conn.
Lots of youngsters first fly with catapult folding-wing glider (AJ Interceptor) and rubber powered, prop driven AJ Hornet. 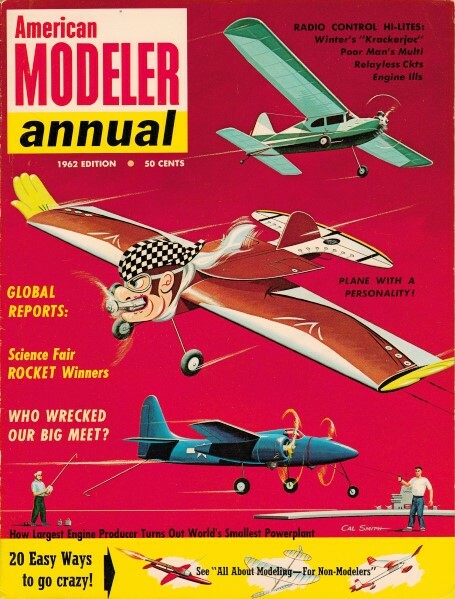 CLIPPER CARGO FREE FLIGHT (Discontinued) - Pan Am also sponsored contest events for conventional gas engine powered models in addition to the PAA-Load event for rocket power already described. Two events were flown, PAA-Load with 1 oz. dummy pilot and Clipper Cargo with 1 oz. pilot plus 1 oz. dummy cargo "box." The popular .020 cu. in. engine was maximum size allowed and maximum model dimensions for PAA-Load were 36" and 48" for Clipper Cargo. Most PAA-Load models were conventional free flight tractor design having light built-up tissue covered structures. Space had to be provided for dummy pilot or cargo which was a specified size. 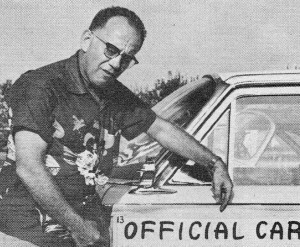 "Pilot" visibility and enclosure were also required. Much experiment with pod and boom and semi-scale amphibian designs added originality to this competition. The PAA-Load event scoring was based on endurance and the Clipper Cargo event scoring was based on maximum gross weight lifted. This was the alt-up weight of model, fuel, payload and ballast, if any. A Clipper Cargo record was established when gross weight of 51 oz. was flown. That's a bit over THREE pounds and this behind a Pee-Wee .020 engine. Minimum flight duration could not exceed 40 sec. and payload had to be carried and landed safely to gain credit for an official flight. GAS MODELS FREE FLIGHT - Far and away the most popular model' competition event, gas powered free flight has been the "main event" since the early 30's. Its popularity is strongly challenged now by control line flying because of -the wide open flying spaces required for the modern powerful high performance designs. Where in former years six foot monsters staggered into the air for short hops behind straining "60" engines; by contrast today's 1/2A engine yank three foot models straight up hundreds of feet to glide for many minutes, even hours. Through the years as free flight model performance got better and better, shorter and shorter engine run limitations had to be imposed to prevent fly-aways. Today, engine runs are limited to 20 sec. for R.O.G. takeoff and 15 sec. for hand launching. Flight timing is limited to 5 minutes in competition making dethermalizers necessary to bring model down. Out-of-eight flights within the 5 minute limit often occur. Free flight contest gas models are divided into classes according to engine size: Class 1/2A-.OOO to .050 cu. in. displacement. Class A-.051 to .200 cu. in. and Class B.201 to .650 cu. in. There is an additional class flown in International competition, FAI Power, with engine size limit of .1525 cu. in. and other limitations, which is gain' ing steadily in popularity here. Free flight models follow the typical design and structure pattern of the towliners and rubber jobs already described. Construction is somewhat heavier to withstand engine vibration and higher climb speeds. Wings and tails are built-up with tissue and fabric covering. Fuselages usually employ sheet balsa construction. Timers are used to cut off fuel supply to "glow" engines within the engine run time limits. 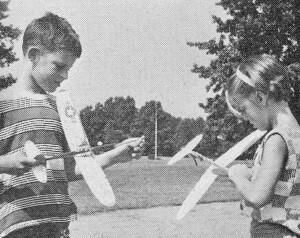 Dethermalizers such as the pop-up stabilizer described for towline gliders are a "must" to bring model down out of thermals. Few limitations are placed on free flight designs. R.O.G. models must be able to rest unassisted in take-off position. Wheels and skids though not required are usually employed. The modern free-flight capable of VTO starts (vertical-take-off) have tails parts fitted with appropriate stands or skids to perm it this. Models are also flown R.O.W. as seaplanes. No special designs are used, the typical R.O.G. 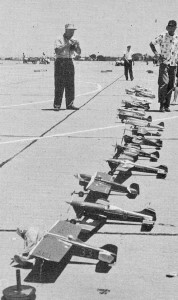 model being equipped with detachable floats and pontoons. Same engine classes are used and engine run is 20 sec. in competition. Free flight models range in size from about 3 foot span for 1/2A's to 6 foot and over for the big 60's. flyers and planes. These are finalists hundreds of officials like chap above.